There are two days left in our Eight is Enough campaign and we have raised $5,975 so far! Thank you to everyone who has already donated! Our goal is to raise $8,000 for our special needs fund by April 18th. To help us reach our goal, PPR supporters Chris and David, along with their two PPR dogs, have generously offered to match the next $1,000 in donations! So, for every dollar you donate, Chris and David will donate another dollar until we’ve reached our 8K goal. If you donate $8, Chris and David donate another $8, it’s that simple! That’s DOUBLE THE DONATIONS! If you can, please donate below so Chris and David’s can DOUBLE YOUR IMPACT. Eight is enough if enough people care! Would you give $8 to help a dog like Dolly? Dolly comes to us from The Redlands, an area with a huge stray dog problem. She had an owner, but they would not get her the care she needed, after she was hit by a car. Local volunteers worked hard and convinced the owner to give up Dolly, then asked Poodle and Pooch Rescue for help. Dolly is with us now and WE will help her get the medical care her prior owner would not afford her. Dolly's right hip is dislocated and she has several road abrasions from the car hit. Her bloodwork indicates low albumin, which is something we see often in dogs that are starving. We are keeping Dolly comfortable with pain medication and are making sure she gets plenty to eat. She is resting on a comfy bed, and being doted on by the veterinary staff at Chuluota Veterinary Hospital. Next week, when her bloodwork has improved, we will do a femoral head ostectomy (FHO) on her right leg to repair the joint. With her FHO surgery, Dolly will be running around care-free again in no time! Poodle and Pooch Rescue saves as many special needs dogs as we can afford. Help us save dogs like Dolly by donating to our Eight is Enough Campaign. Eight is Enough, when enough people care. Please give us eight dollars for Dolly so we can raise $8,000 by midnight on April 18th! Thank you for caring! Tammy just arrived at Poodle and Pooch Rescue from Miami Dade Animal Shelter. She is a senior Poodle girl that has been neglected for a long time. The most obvious sign of neglect is the large tumor on her chest that has been left to grow for many months. Tammy also has several small masses on her snout and arrived with an upper respiratory infection. Her ears and eyes are infected, and her mouth is painful from several infected, decaying teeth. Within hours of arriving at PPR, the kind veterinary staff at Chuluota Veterinary Hospital had Tammy cleaned up, and Dr. Zern examined her. We will perform surgery to remove Tammy’s tumors next week, once she has recovered from her upper respiratory infection. Despite all the neglect Tammy has suffered, she is the most sweet and gentle girl. Can you imagine how excited she must be to start her new life?! From the kind volunteers that transported Tammy to PPR, to the caring vet staff making sure Tammy is comfortable, to our generous donors, to our fosters and adopters – it truly takes a village to come together so we can save dogs like Tammy. No act is too small, so please team up with us and help us help Tammy! If you can, please donate $8 (or more) to our Eight is Enough campaign. We are trying to raise $8,000 by April 18th to replenish our special needs fund, so we can continue to save the dogs that nobody else will. Together we can do it! Maddie suffered a major trauma and was running out of time at animal control. Her pelvis is broken, she has a back injury, and is completely paralyzed in both hind legs. When we received a call for help, we immediately said Yes! and rushed Maddie to our surgeon. A complete medical exam revealed that Maddie was in even worse shape than we originally thought: Maddie was in such pain from her back injury, she was unable to urinate. Our surgeon surgically placed a catheter and started her on pain medication to get her some relief. Maddie was also in such poor condition from years of neglect that she needed a blood transfusion. Her eyes were infected and uncomfortable from a condition called Keratoconjunctivitis Sicca, or dry eye, that had gone unaddressed for years. Maddie’s been at Poodle and Pooch rescue for two weeks now and she is doing great! She moved to a foster home, and now that the medication is managing her pain, she is able to urinate by herself. Maddie is on crate rest for several weeks to heal her broken pelvis, but when she gets the all clear to move around, we will look into getting her a wheelchair for some added mobility. In the meantime, she is loving life lounging on the coziest of dog beds! Your donations to PPR save dogs like Maddie. We are all volunteers and the dogs live with our foster families so your donations are not spent to pay salaries or for a big building. When you help us, you help dogs. It's that simple. Please donate to our Eight is Enough Campaign. We are trying to raise $8,000 by April 18th to replenish our special needs fund! Please help us save more dogs like Maddie by donating below. Thank you. Poodle and Pooch Rescue is the last resort for hundreds of abused and neglected dogs every year, like Angel. Angel is a senior, who came to us from a breeder, because she could no longer produce puppies. Her mouth was infected so badly, the infection and scar tissue from months or years of neglect prevented her from being able to open her mouth. Within minutes of her arrival, Angel received the surgery she so desperately needed to be comfortable again. Can you imagine what she's been through and how happy she is to be with PPR now? Please donate $8 to our Eight is Enough Campaign so we can continue to save dogs like Angel. We are trying to raise $8,000 by April 18th to replenish our special needs fun. Eight is Enough, if enough people care. These two sick and frail girls were left outside of a vet’s office in a crate. Ireland is a little Terrier girl, most of her body hairless, infected skin, infected ears, infected mouth, underweight, terrified – she is a mess. Clover is a tiny Chihuahua girl who suffered a trauma that left her paralyzed from the waist down, she requires her bladder to be expressed several times each day. She was also loaded with infection, emaciated and absolutely terrified, like her sister. Their human failed them; all they’ve known are years of neglect and ultimately abandonment. We need your help. These girls are going to require a lot of medical attention, time, patience, love and care. Poodle and Pooch Rescue has committed to this deserving duo and we need your help to get them well. With your donation, we’ll send you detailed updates including their eventual adoption. PPR focuses on so many cases like this, and we’re able to say “YES!” thanks to our donors. Please enable us to continue saying “YES!” to dogs like Clover and Ireland so we can treat them, love them and teach them that not all humans are as disgusting as the ones who did this to them. Please donate below to give these two girls brand new lives. Liana is a PPR foster mom. She isn't picky about who she fosters; Liana knows that she's helping to make a difference in a dog's life. Riley needed Liana and that's all that mattered. Liana didn't care that Riley was blind and Riley is as happy as a clam to receive all the love and attention as the only dog in the home. Riley came to PPR with inflammed eyes and no vision. She visited our opthamologist and it was determined that her eyes were a source of a lot of pain and restoring her vision was no longer an option, the eyes had simply been neglected for too long. Given this diagnoses and the pain that the eyes were causing for Riley, we removed her eyes to make her more comfortable and we're so glad that we did! Riley feels great! She loves going on walks and enjoys her daily couch snoozes. She'd be great for apartment living, as she rarely barks and if you're away during the day, she's just fine with that too because she enjoys her alone time and her afternoon siestas. Riley feels better than she's felt in a very long time and she'll be ready for adoption soon. If you're interested in this sweet, easy going gal or any of her pals, just fill out an application and one of our volunteers will be in touch. In just three short weeks, Ellen has gained confidence, learned to trust and is starting to heal in her foster home. The photos above are from Ellen's first day in foster care, then from this week in foster care. Her fur is coming in and her head is starting to rise with confidence as she starts to trust the humans in her world. Her previous humans failed her and we are repairing that. This is what it means to be a foster parent. You were born with the ability to change lives, don't ever waste it. Sharon and Norman, Sniffles' new doting mother and father, couldn't be happier that PPR chose them to adopt this beautiful, special young man. They recently euthanized their dog and wanted to make another dog’s dream come true. They understand that older and special needs dogs are the ones that have the hardest time finding a home so when they applied to adopt Sniffles, we found them to be perfect for him. Sniffles will never be alone because Sharon is a home maker - how awesome is that? Norman is a medical doctor so he certainly has the knowledge to understand and appreciate the condition and care that Sniffles will need which includes daily cleaning of the nasal passageway. Norman and Sharon have a lot of experience, they have rescued and cared for dogs their whole lives. In fact, they have enough room in their hearts and their home that they've asked PPR to consider them for another special needs dog in the near future. Thank you, to Sharon and Norman, for your gigantic, loving hearts! Cherry, one of our newest breeder throwaways, arrived very painful due to the degradation of the tissue that used to be her eyes (see her arrival photo in prior post). Within hours of arriving at Poodle and Pooch Rescue, Dr. Zern performed surgery and Cherry is doing great. During her recovery, Cherry gets to hang out with the front desk staff at Chuluota Veterinary Hospital, making up for lost time with kisses and laps. The breeder took her eyes, but Cherry can still look forward to a life where she will hear adoring voices, feel gentle hugs, taste delicious chicken and of course-- smell butts! And best of all, now that she's not a breeder's prisoner, Cherry will finally know the feeling of safety, love and family. Debbie and Rebecca spoiling our girl. Cherry is only four years old, but she spent those years with a breeder. She recently had puppies, then was dumped at animal control with two of her breeder sisters. We can't put this photo on FB because we are monitored as a business so FB will delete it. But you can. Please share this photo on FB. Cherry needs to be seen. Those who purchase puppies from breeders and pet stores need the truth. Dr. Zern operated on Cherry immediately. She is now recovering from the surgery to remove the tissue that used to be her eyes. Cherry is NOT an exception. Our WORST cases of abuse and neglect come from breeders. Cherry was hidden in a back room or off site so that customers wouldn't see her. Breeders aren't stupid. They know that dogs like Cherry will put them out of business. Let's show the hidden faces they won't. Cherry is the face of the breeding business. Let’s get Cherry all over facebook. The very least we can do is look at her. Frodo is another lucky fellow who came to PPR from Orange County Animal Services. He is an older Schnauzery boy who had a growth on his lip that we had to remove. It may or may not be cancerous (we are waiting for the histopathology report) but either way we will ensure that Frodo is spoiled for the rest of his life. Frodo is recovering now with Dr. Peters at East Orlando Animal Hospital but is ready for a foster home. If you would like to foster this chunky boy or another one of our newbies, complete the Foster Application. Thank you Dr. Peters and East Orlando Animal Hospital for helping us save so many!! Toby was born blind. This 6-month-old puppy doesn’t seem to think that’s a problem. He’s right. His life will be different, but no less full of love and fun. Toby spends all his time doing what puppies do – playplayplaying, snoozing, then playplayplaying. Toby loves his foster family and does lots of kissing and getting kissed. Who could say no to that face? He’s learning to walk on a leash and because he’s blind he’s not as distracted as sighted puppies on walks. Training a blind puppy is a little different than training a sighted dog, but because he uses his other senses much more than a sighted puppy, training him isn’t harder or easier ... just different. Toby, 11 lbs, will have his eyes thoroughly checked by Dr. Fife, our ophthalmologist, to see if we can restore his vision through surgery. Either way, this puppy will have a blessed life, full of love, toys, playtime, and lots of kisses. Toby will soon be up for adoption. He’d love to go to a home with another very playful dog who will help lead him around--his own personal seeing eye dog! In the meantime, Toby is having the time of his life." Squeaky Gets a New Life! Squeaky was hit by a car and had a fractured hip. She had been at animal control for two weeks because nobody wanted her. But now she is with us at Poodle and Pooch Rescue. This sweet girl will be evaluated by our orthopedic surgeon and we will help her. Poodle and Pooch Rescue is the last resort for so many dogs that have nowhere else to turn because they are injured, have a medical condition or are seniors. We know that if we don't take them, nobody else will. Please help us save more special needs dogs with a donation below. We are all volunteers and the dogs live in foster homes so your donations are not spent on salaries or a building. Your donations save dogs. It's just that simple. Max is getting a bath so he can be ready for his adventure tomorrow. He is going to visit Dr. Lynn Honeckman with Veterinary Behavior Solutions for an evaluation, then on to Every Dog Has Its Day to work with head trainer Mandy Burger for some socialization and training. Max came to us from a hoarder. Of the over 70 dogs we got from this hoarder, Max was affected the most by the neglect he suffered. Max will need a very experienced home with a very special person who is devoted to making him feels safe. This big boy isn't ready for a home yet, but we hope he will be soon. First, we'll help him learn that from here on out, he can trust people again. Thank you for donating to Poodle and Pooch Rescue so we can help dogs like Max. Tank Tops, T-Shirts, Long-Sleeve Shirts, Hoodies -- You name it, we have it!! Pick your color, style, size and wear your PPR shirts everywhere! When people ask, tell them about Poodle and Pooch Rescue. This is a stylish way to spread the word! https://www.teepublic.com/user/poodleandpoochrescue Pick your favorite design on your favorite color! Here is just a sample of the styles and colors available. Poodle and Pooch Rescue is a 501(c)3 non profit organization that saves dogs that truly need help. We rescue the "leftovers" from animal control, the dogs nobody wants because they're older or suffer from neglect, abuse or have a medical need. Their "last" day becomes the first day of their new life. We provide the veterinary care they need, a foster family they love and when they're ready, we adopt them to a family who cherishes them. We do not have a physical shelter because every dog lives with one of our foster families. 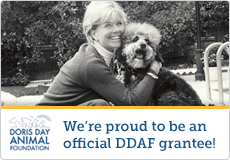 We are all volunteers so your tax-deductible donation goes directly to help the dogs. We have saved over 3,800 dogs since 2008. Please help us save even more with a donation marked "Special Needs". Our greatest need is for donations for our Special Needs dogs, some of whom you can visit on the In Recovery Page. This little girl came to us from Orange County Animal Services in late February. We named her Annie. Annie has a long list of medical issues, but she feels good! Her appetite and energy are great, and she loves everyone she meets. Annie is blind, had several tumors that we have removed, and has an ongoing liver issue that is causing her to have seizures. Annie is a senior and given her health conditions we think she may only have 8 months left, but hopefully more. She will live with a PPR Furever Foster Family where she will be spoiled every single day for the rest of her life. PPR will provide all of her veterinary care. Is Eight months Enough to save this dog? Annie thinks so because she knows the rest of her life will be the best of her life. If you agree, please donate $8 to our Eight is Enough Campaign. We have raised $5,278 so far and are trying to raise $8,000 by April 18th so we can continue to save dogs like Annie. Eight is Enough, if enough people care. Our "8 is Enough" campaign has raised $3,795 so far! Thank you to everyone who has donated already. Our goal is to reach $8,000 by April 18th and we are almost halfway there! If 526 more people donate $8 to Poodle and Pooch Rescue, we will meet our goal. Please share this fundraiser with your dog-loving friends and family. Let's find those 526 people!! Please donate below if you can help. Eight is Enough, if enough people care. Thank you!! Sugarplum and A.J. are “throwaways” that made their way to PPR, after their breeder no longer wanted them. The pair was surrendered to a groomer, because they were no longer “useful” to the breeding operation. They were handed to the groomer matted and filthy, crawling with parasites, and covered in feces. After a nice clean bath and a makeover, Sugarplum and A.J. made their way to PPR, so they could receive the veterinary care they so desperately needed. Sugarplum is 9-years-old and her body shows the signs from being bred over and over again. Upon intake, our vet determined that Sugarplum had pyometra, a serious and life threatening infection of her uterus. Thankfully we caught it just in time, so we immediately rushed her into surgery, where our vet removed her uterus. Sugarplum's right side was also full of mammary tumors, so we performed a mastectomy at the same time. A.J. is 7-years-old and arrived cryptorchid, which made his neuter surgery a bit more complicated. Both dogs also needed dental work. Please donate $8 to our Eight is Enough campaign so we can continue to save dogs like Sugar Plum and A.J. For you, $8 might mean skipping your next Starbucks latte, or passing on eating out for lunch. For dogs like Sugar Plum and A.J., your donation allows them to start over with a brand-new life! Eight is Enough if enough people care! Would you give $8 to help a dog like Walter? Walter is a senior Poodle boy that was surrendered to a local county shelter. His previous owners did not properly care for him. Walter is blind from an eye condition that was left unaddressed and his mouth was infected and painful. Now, Walter is with us at Poodle and Pooch Rescue, ready to start his new life. He received extensive dental surgery, during which we had to remove all his teeth, because they were so rotten. He will have to eat soft food for life, but he will be a happy guy because his mouth no longer hurts. We cannot revert his blindness, but this does not slow down Walter one bit. He gets around just fine and when you meet him you will quickly realize that there isn’t a sweeter dog around. Poodle and Pooch Rescue saves as many special needs dogs as we can afford. Help us save dogs like Walter by donating to our Eight is Enough Campaign. Eight is Enough, when enough people care! Please donate so we can raise $8,000 by midnight on April 18th! Thank you for helping special dogs like Walter. Many of our adult/senior dogs come from breeders. They are getting out of the business/downsizing or have dogs that are not producing anymore due to age or health issues. These dogs need veterinary care, which we are happy to provide so that the dogs can start their new lives. We get them the specialized care they need so they will be ready to start their new lives being spoiled by a family. Usually breeders have too many dogs and hide their condition for fear of being turned into the authorities. But when breeders give us their dogs, we keep their names anonymous. We usually don’t even know their names or where they live, nor do we care. Sometimes they meet us in parking lots surrendering 2 - 20 dogs. Sometimes they ask us to come to their property to load up all of their dogs. Sometimes they have a family member or friend bring the dogs directly to our vet. Usually the condition of these dogs is awful, but we are used to that. We get them the veterinary care they need and find them loving families. Please, if you are a breeder or know a breeder who is looking for a way out, without getting into trouble, we will help. We have helped over 30 breeders get out of the business and we are happy to help you or someone you know. Whether it’s 2 dogs or 200 dogs, please call us at 321-277-3089 or email us at info@poodleandpoochrescue.org. Angel arrived yesterday at 1pm from a breeder who did the right thing by calling us for help. Angel (pictured above) was in surgery by 1:30 for a mouth so rotten, the scar tissue prevented her from opening it. If you can help us afford Angel's care or her sister Lilly (pictured below), please click here. Thank you. To quote our beautiful volunteer, Teresa, who met this young lady to collect donations for PPR - "This little girl, Becca, is the sweetest thing ever! She raised $410, a dog bed and a bunch of toys to donate to PPR for her 10th birthday. She said she sees advertisements for dogs that don't have homes and she wanted to help. Her friend told her about PPR and that's when she decided that she didn't need birthday gifts, she just wanted to help dogs in need." WOW! We are in awe of this young lady and her kindness. Thank you, Becca, for recognizing the need and for your heartfelt and selfless act. At such a young age, you are wise beyond your years. Irene adopted two dogs from PPR, but she wanted to do more. So, Irene became a Furever Foster Mom. This is someone who fosters a dog for the rest of his life. When dogs come to PPR with a terminal disease, or they are very old, our goal is to spoil them for whatever time they have left. These dogs are happy and they feel good. They just need that special person to spoil them silly for their remaining months or years. PPR vets continue to provide all the care they need, which is crucial, but their real heroes are their foster families. Irene is furever fostering Charlie who continues to thrive and she has just welcomed Tanner, pictured in the photo. Everyday, Tanner and Charlie thank Irene for giving them the time of their lives. If you want to be a Furever Foster Family (or a regular foster family), click here: Foster a Dog. Ricky is an older guy with some health concerns who found himself homeless when his owner passed away. He was in search of a new family to love him, but he knew it would be tough to find since he was 13 years old. To his pleasant surprise, Heidi read about his story and knew she had to help. At just 28 years old, Heidi opened up her heart and her home to adopt this special needs, senior boy. His new name is Cooper (he doesn't mind the name change, he can't hear) and man is he living the good life! He goes to cafes with mom, gets to play with his new big brother and he even got to enjoy the strawberry festival in his very own stroller! Heidi didn't scoop up a puppy, she knows how special seniors are and how much love and life they have to offer. Thank you to Heidi for recognizing that these guys only get better with age. Sometimes all it takes is a simple act to make a difference in the world. These photos tell the story of a little girl who’s doing just that. Isabella is an extraordinary young lady who paints shelter pets to help them find homes. Isabella is autistic, speech impaired and suffers from anxiety, but painting these pets in need helps to calm and relax her. Not only is Isabella helping to get these deserving souls the attention they need, she sells her creations and donates all of the proceeds to her own special needs school. Pretty remarkable, right? Isabella’s mom shared these photos with us, featuring two PPR dogs, Baby Boy (aka Moo) and Bodhi, and she captured them perfectly! Isabella, we think you’re pretty special and we cannot thank you enough for creating this beautiful art for PPR’s dogs and for so many others. The world needs more people like you and we’re so touched and honored to be the recipients of your beautiful gift. Michele Wacker letting Checkers know he's going to be ok. If you're a dog, Dade County is your worst nightmare. Dogs run the streets and are NOT being picked up by Miami Dade Animal Services. Alex Munoz, the Director of MDAS, does not want to get his hands dirty. He and the Mayor of Dade County, Carlos Gimenez, have decided to make MDAS a "no kill" shelter. This means they close their doors, or more accurately, turn their backs on the suffering strays in their county. Why? -- to inflate their egos which are already the size of the Hindenburg. So they warehouse dogs inside MDAS, while dogs outside their doors are starving, being tortured and at best suffer a quick death by automobile. All the while, Munoz and Gimenez sit on their high horses, claiming clean hands while boasting about their "no kill" policy. This is a scam. While these politicians claim sainthood, the thousands of dogs outside their doors beg for the relief of euthanasia rather than the slow, painful deaths they are suffering on the streets of Dade County. Dade County is the same place that Poodle and Pooch Rescue visited 3 years ago, expecting to spend two days gathering strays, but within 2 hours we had 53 dogs. We didn't have room in our cars for any more. Since then the situation has worsened. So while people from around the country and around the world come to visit Disney World, enjoy the night life of Miami, and the beaches throughout our state, Florida continues to put its best face forward. But be careful Florida. Your dirty little secret is getting out. Dade County can't keep this quiet much longer. If you pick up a seashell on Miami beach and hold it to your ear, that's not the ocean you hear, nor is it the sound of air leaking from Hindenburg egos, it's Munoz and Gimenez whispering "Shhhhhh"...... the official policy on handling the strays in their county. Dr. Zern with Checkers. Checkers came to us with a testiclular tumor the size of a grapefruit. After surgery, he's ready for a home. Wynwood had been struck by a car. After lots of recovery time, this boy is thriving in his PPR foster home, ready for adoption! Noel suffered a trauma that left her paralyzed. She's an unstoppable girl who gets around great with just her front legs. Her cart is being constructed right now so that she can keep up with her foster siblings! Before PPR and After PPR! Gabby is another senior that came to Poodle and Poodle Rescue after years of neglect. She is finally ready for a home and she even has a new hair-do too! Gabby is blind (from neglect) but that does not stop this gorgeous senior gal. She is ready to enjoy the rest of her life. She is full of love, life and happiness. She is so grateful to the donors who made her new life and new look possible! Thank you to everyone who supports our work! Gabby Dabby Do!! Watch the video of Savannah at animal control, trying to tell her story to the animal control volunteers. Don't worry, she's in a car, right now, on her way to Chuluota Veterinary Hospital to begin her new life with Poodle and Pooch Rescue. This girl has been neglected for years, but somehow she maintained her sweetness. Savannah still has faith in humans, and we won't let her down. Please help us give her the life she deserves by making a donation below. Thank you. A year ago, at just two months old, Kona was abandoned outdoors, tossed out like trash. She was loaded with parasites, pooping blood and starving when she was found. PPR brought her into care, treated her, spoiled her and when she was well enough, found her the perfect home. Fast forward to today and Kona is celebrating life and enjoying her new sibling, another recent rescue, Baxter. Kona and her new mini-me, Baxter, are best pals that will live an amazing life together because their parents chose to rescue. This is what it's all about right here. This is what keeps us going. If you're interested in fostering or adopting, send us an email to info@poodleandpoochrescue.org - the more homes we have, the more lives we can save. From Buckshot to Hot Shot! George arrived at PPR after being shot. His leg was leg was full of buckshot and the bone was shattered. After an amputation and heartworm treatment, he went to his foster home with Toni and Morey. End of story!! Everyone fell in love and now George's days are filled with hugs, kisses and play time with Duncan and Lady, his doggie siblings. George was shot by a coward but rescued by two heroes! Chipper came to us from a hoarder, along with 70 other dogs. They were scared and scarred, depressed and defeated. They were hopeless. After extensive veterinary care and months of emotional recovery, most of them are with their forever families now and have forgotten their past abuse. When you live in a cage for years, time passes slowly. Sleep is your only escape. But in their new lives, there's no time to sleep because life is too much fun! These dogs take advantage of every waking moment. If not for your donations, Chipper would still be in the hoarder's cage, hoping for the relief of sleep. Instead, he's living his dream with a family who adores him and enjoying his newest favorite activity--swimming! He can hardly believe how lucky he is and it's all because of you. Please donate to Poodle and Pooch Rescue so we can save more dogs like Chipper!! Rebecca helps Central Florida families find their new homes while helping our pets in need do the same. If you're looking for a new home, please visit www.TheRescueRealtor.com. With each home purchased or sold, Rebecca makes a generous donation to the animal welfare organization that you choose - like PPR! When you find a home, so do they! You can help by adopting, fostering, volunteering or donating so we can save more dogs. Please visit the How to Help page for more details. To adopt, please fill out the Adoption Application and we'll call you to help find the right match for your family. To foster, please fill out the Foster Application. We ask for a 2-3 week commitment and we supply everything you need. All of our dogs are fully vetted and groomed before going into foster care. You can also call or email us so we can answer your questions. Our foster moms and dads are our heroes! To volunteer, email us and let us know what you'd like to do. We need transporters, help with events, people that can sew and lots more! To donate, please click on any of the paypal buttons on our website.